Introducing my first DRSSTC. 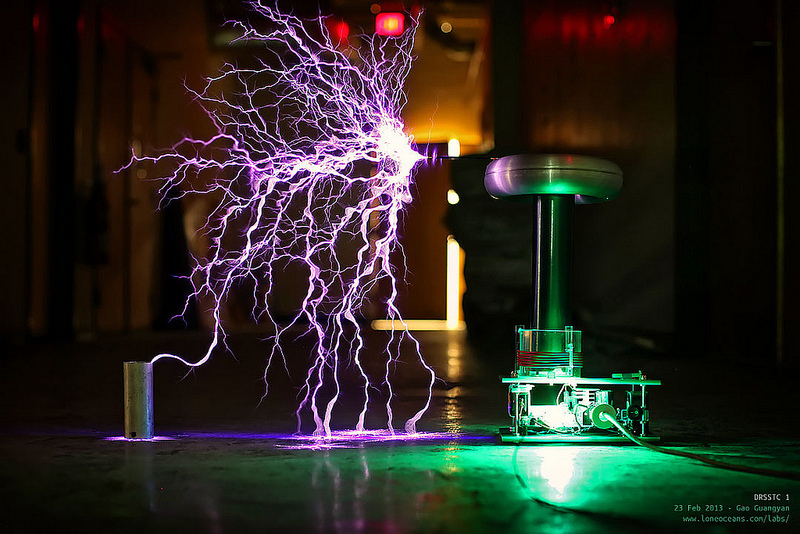 It’s a small tesla coil made to be portable and to make lightning at home. This coil is based of the amazing oneTesla pcb. I’m still in the process of doing a detailed write up at http://www.loneoceans.com/labs/drsstc1/! Max spark length – I don’t know yet, does >22″ sparks to free air and ground with ~100us on-time. More testing to come soon. Right now it’s limited by hitting the floor. Performance has been pretty good. Originally, the coil used a 0.068uF 940C capacitor but that made my primary frequency about 19% too high and I lost a 60N60 half bridge. Increasing the primary to 8 turns of 14AWG (k=0.26) turned out to be a bad idea and I had a lot of racing sparks. After a few more coats of Polyurethane on the secondary, a return to 6 turns of AWG14 and a larger tank cap, the coil is in tune with a performance I’m very happy with.